Tyler, The Creator x Converse Golf Le Fleur releasing in new colorways this Saturday. At least two more colorways of the Tyler, The Creator x Converse Golf Le Fleur collaboration are in the works, including the upcoming "Industrial Pack" which is slated to release this Saturday, February 23. Each sneaker boasts a two-toned leather colorway, featuring the familiar Golf Le Fleur logo on the tongue and the floral logo on the side. 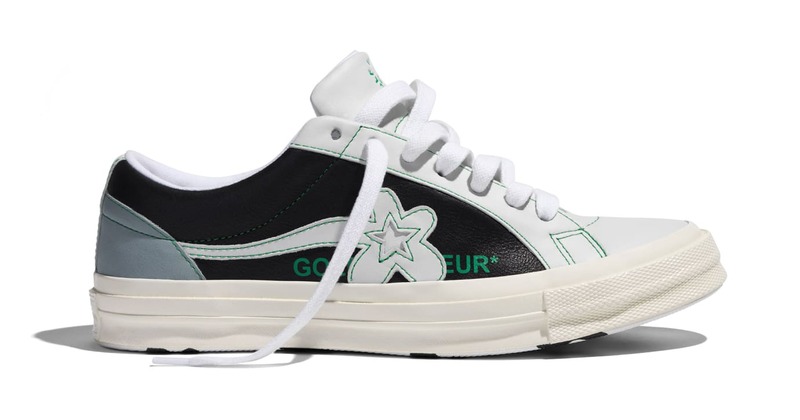 As seen in the official photos provided by Converse, one pair comes in a white and black design equipped with green stitching, while the other features dark and light blues. Both pairs are grounded by cream colored midsoles and an all-over floral print on the sole. According to Sole Collector, the Tyler, The Creator x Converse Golf Le Fleur "Industrial Pack" will release alongside a matching boiler suit as a nod to '60s American workwear. The full collection will be available at converse.com, golfwang.com, and other select retailers this Saturday.